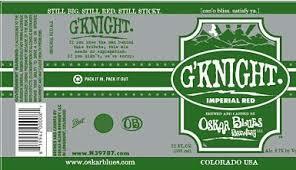 On tap at Shepherd & Knucklehead, improved updated version of Gordon (now listed as an Imperial Red/ Imperial IPA hybrid) got christened G’Knight in 2012. Orange-bruised cherry-berry ripeness infiltrates sugary malt sweetness to helles bock-like biscuit-y Graham Cracker spine. Sharp hop bite deepens fruity assertion.